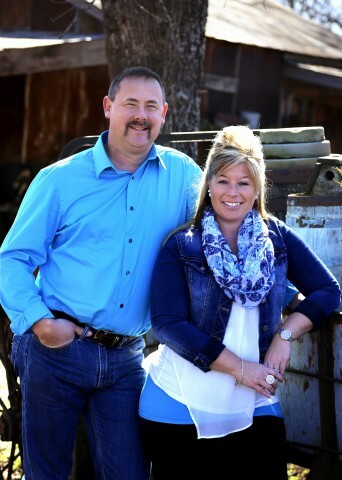 Pictured:Owner – Kasey Johnston, with her husband Bill. Hi, I am Kasey Johnston owner of Half-Crocked Antiques. I started out at an early age going to yard sales, flea markets, auctions ect. We had enough growing up but not a lot of extra. I learned early to try and get the best deal you could! When I moved out on my own, I learned even more how important it was. If you wanted something cool to hang on the wall you better drive around to every little place you could find because you couldn’t afford to order one from a catalog! After a while it got to be not just about the pinching pennies and saving money….it was about the hunt. The excitement of never knowing what you might find. Sometimes you might even find something you had no idea what it was but you had a vision of what you could turn it into. Also, it was seeing the history and learning to love the things that had already been wore and tore. I got to where I didn’t want to buy anything new….I sought after the old stuff. I started off doing a booth in an antique mall with my Mother. She thought it was a fun idea and it gave us reason to spend time together and think of different ideas. Once we got started it was a blast! A whole new reason to go buy things. I would sell some and probably keep…more! Once I got sick of them though, I would find new cool things and sell some things I had at home and keep something different. It was a great way to support a bad habit. A friend of mine that owns an Antique mall told me about a building for sale. Even though I was a little nervous about starting my own business – how cool would it be to have 10,000 square feet to put my junk in? So I dove in head first and we gutted it from top to bottom. Had some friends who also liked to buy and sell that rented a few booths. Then a few come in from here and there that was excited to try…..after about a year we had a store full! I personally love crocks – I collect every kind of crock. I wanted a name that was unique and different from everyone else’s so my husband mentioned the idea of “Half-Crocked” Antiques. At first I thought it was the silliest name I had ever heard and when I couldn’t think of anything else I liked, I went with it. Now I can’t imagine anything else, people come in laughing and chuckling going on about our name, and then when you realize we are in “Bourbon” Mo it just makes it that much greater. I myself specialize in primitives. I love the old grungy stuff. I love the old step-back cabinets and dough bowls and chippy paint benches and barrels and buckets and wash tubs. We have a lot of primitives in our store and are getting known more and more for them. One thing I have learned about having a store though is you can’t have tunnel vision…just because I love primitives doesn’t mean everyone does. Some people could care less about them, so we have many other booth’s with many other things. We have advertising signs, beer signs (for your man cave), neon lights, cases for the money collector with coins, glassware, handcrafted wood items, the shabby chic furniture, old furniture – both nice and some that needs a little love…. (for that person who loves to repurpose), customized metal décor, jewelry, handcrafted Ken Richardson knives, baseball cards, homespun fabrics, and just a lot of fine antiques. We also sell country store items like barn stars and pip berry picks and strands. We also have Route 66 soda’s and fudge in case you get wore down and stressed while you are shopping and need some sugar! One thing I take pride about in the store and get several compliments on are the prices. People like it because they can come in and can actually afford to buy something most of the time. All of our vendors are great about bringing in those great finds and pricing them at a good decent price. I love to look and shop but if you can’t afford to buy anything it isn’t any fun. I have a motto, if I can buy something and make a little on it, I would rather price it reasonable and see it move quicker and pass the deal on to some-one else. I love to see people come in the store and leave with something they love! It didn’t take long to realize this business wasn’t easy – you have to have a real “ love” for it. There is a lot of work involved that people don’t always realize….the cleaning all the cob webs and dirt off, the pricing and moving heavy furniture (time and time again)…the rearranging, the constant hunt for something to sell – waking up at 4 am and the hundreds of miles you drive to get to a sale and the hours you spend standing on your feet when there is a chance you may drive home with nothing. Always trying to have a new look and re-doing things – I am always on the look for new people to bring in good and different things to the store. The paperwork that goes along with it too can be over-whelming. Sometimes I catch myself getting tired and frustrated and over-whelmed and my husband can sense it and he just looks at me and says “If it was easy – everyone would do it”. And every time he says that, it grounds me again and I just smile because it is so true. I am a firm believer you have to work hard if you really want something and you really have to love what you are doing. So, I just get back up and stop feeling sorry for myself and get back to work! So there is a short history on me and my love of junk! I have four children who the collecting and hunting has been passed down to also. Some of them enjoy it more than others…..I have one who loves to collect and look things up and try to sell them (I have even seen him try to get a better price at the Flea Market! )…..I have a couple who I have totally burnt out and they cringe when the brakes go on when we are passing a yard sale and we stop mid track. I think once they get older they will look back and appreciate buying older things with character rather than going to a local department store and buying the same thing everyone else has. I hope if you are in the area you will take the time and stop by and see us at Half-Crocked Antiques! We are just a huge family of people who love to buy and sell antiques. I am sure we have something you can’t live with-out!